For Treasure Chest Thursday, I have selected this a copy of a rare document. The original is in the possession of my cousin and it was passed down through her Bonita-de Braga side of the tree. This is a copy of an orginal sugar plantation contract. The contract was my Great Great Grandfather’s. Jozimas de Braga signed this contract prior to leaving Maia, Ribeira Grande, Sao Miguel Island, Azores. The contract states that my Great Great Grandfather would work a certain term. The term was 3 years of labor at 10 hours a day, 6 days a week. In exchange for the labor, the ship passage was paid form. Also, upon arrival at Koloa Sugar Plantation, he and his family would receive food, housing, medical care, and schooling for school age children (depending on if they were needed to catch rodents in the fields or to help with harvest). Work started at 6:30am and 5pm. The laborers went home to eat dinner. Curfew was at 8pm when lights had to be out. And, the next day, the whole thing started all over again. The Portuguese were encouraged to migrate as families. The sugar plantation owners saw them as a viable future work force–and one that would balance out what they saw as a dangerous increase in Asian laborers in the Hawaiian Islands. The contract spelled out wages. The wages on Hawaiian Sugar Plantation were determined by job title and race. A Filipino person doing the same work as a Portuguese person would be paid less. The Portuguese were in a strange position. Because of their darker complexion, they were considered caucasion, but not white. While they were paid more than their Asian counterparts, they were paid less than German, French, Italian, and American laborers doing the same job. My Great Great Grandfather’s wage was 9 dollars for 26 days of work a month. What makes this document so rare? The sugar contracts were never preserved by sugar plantations owners. Because an assessment of sugar plantation records did not take place until the 1980s, the only known sugar contracts were in the hands of the laborers themselves and then pass down to their descendants. Very few people have their ancestor’s original sugar plantation contract. 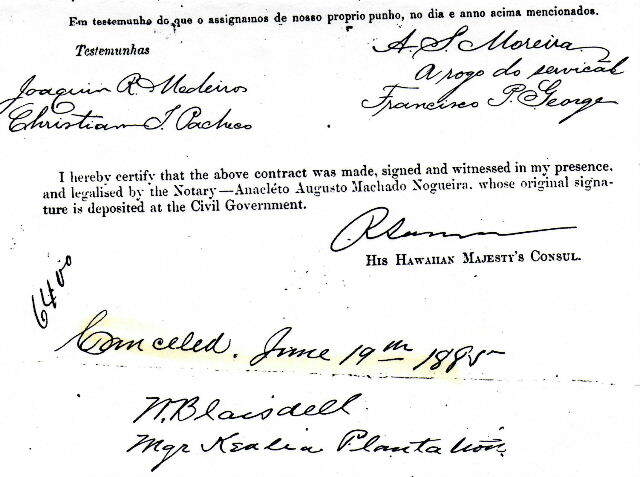 In the 20+ years I have been researching Hawaii, I have only come across one other person who had their ancestor’s sugar plantation contract. Let’s use my Great Great Grandfather’s contract as an example. 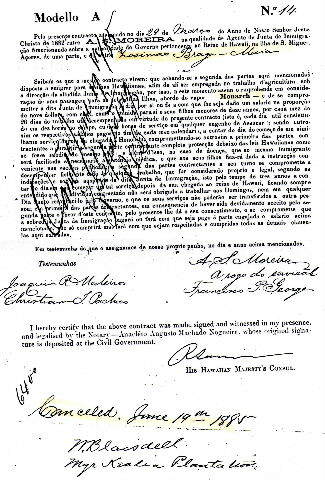 This document was signed back home on the Azores in March of 1882. Jozimas carried it with him on the voyage. He carried it with him to Honolulu and then Kauai where he was assigned to the Kealia Sugar Plantation. He carried it with him to prove his legal status in the islands. 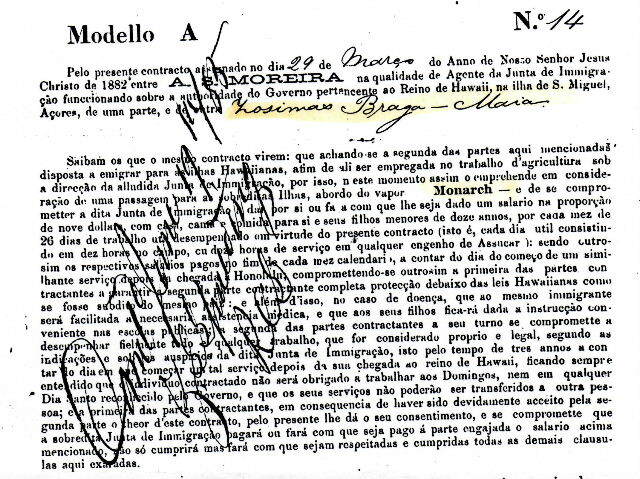 As you can see, Jozimas de Braga’s contract was cancelled on 19 June 1885 when he completed this contract. This document was proof that he belonged in Hawaii. It was also proof that he fulfilled the terms of his contract. I suspect that he would need it for further employment–or he might be arrested and returned to the plantation he was contracted with to complete the terms. Jozimas then worked for the Kilauea Sugar Plantation on Kauai. In 1907, he left for Oakland, CA. Then around 1914, he moved to Spreckels, CA. And, around 1921, he was back in Oakland. He died in February of 1922. That document travelled from the Azores to Hawaii to California. After Jozimas’ death, one of his children though to put the document away and save it. It’s really a miracle that it made it to the present day. This document looks similar to the one a distant cousin copied for my mother. Jesse, it appears we know the same cousin if you are related to the Bonita’s of Oakland! I am your distant cousin through the de Braga line. De Braga was one of the names in the papers that the lady sent to my mother. She was tracing the family history. The papers were either misplaced or taken by another family member. I would like to get a copy because she had traced back the Azores. Most of my mother’s family still live in the Bay Area. My great great grandmother was Jessie (Jacintha) Madieros. Her husband, Manuel Garcia, and their daughter Maria Jesus, went to Hawaii in 1883 for a contract. I’ll pull out the papers.